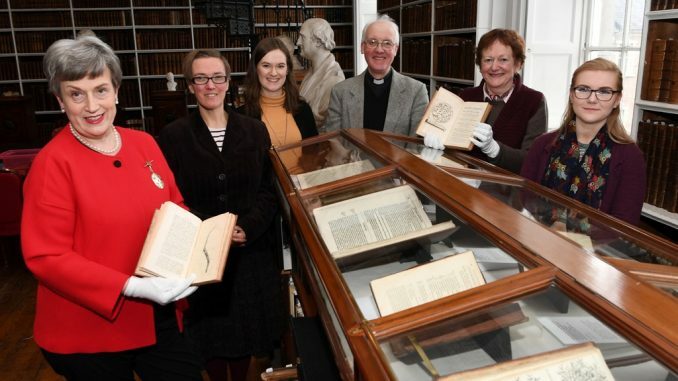 The Library has launched its most recent exhibition on medical books. The display includes an array of works by physicians, pharmacists and anatomists of the 17th and 18th centuries. The exhibition will remain on display in the Library until the end of March. Many of the books on display show what were ground-breaking discoveries in medicine at the time. Much of what is assumed as common knowledge in modern medicine was only then being discovered. They cover a wide range of subjects: detailed information on medical conditions and pharmaceutical practices from 1753; one of the first general treatises on army medicine from 1764; and a 1624 volume that covers a multitude of topics from digestion to goblins. The exhibition also includes books valued by ships’ surgeons, such as John Woodall’s The Surgeon’s Mate from 1639, and the 13th edition of William Cheselden’s The Anatomy of the Human Body, first published in 1713, which became popular with medical students. The Library’s Archivist, Thirza Mulder, and Visitor Assistant, Rachel Toner researched and compiled the exhibition.